One poker strategy that applies to almost every poker game is a tight-aggressive approach. The tight-aggressive approach (known online as the TAG approach) has always been a winning poker strategy. Playing "tight-aggressive" means that you only play solid hands, but when you have a solid hand you play it aggressively. Some approaches you want to avoid include the "Loose Aggressive" approach, where you play most hands and play them all aggressively, the "Loose Passive" approach, where you play many hands and play them all conservatively, and the "Tight Passive" approach, where you play only a few hands and play them conservatively. Although certain situations may call for a quick switch to a different approach, the TAG poker strategy has been proven a winner over and over again. One of the most underrated aspects of a poker player's strategy is his/her bankroll strategy. Even if you are the best poker player in the world, you could easily go broke without proper bankroll management. More skilled players can survive on less of a bankroll than less skilled players, because they are less likely to have a big downswing. Casual players need less of a bankroll than professional players, because casual players can afford to go bust while professional players rely on their poker income. High stakes players should have more of a bankroll than low stakes players, because low stakes players face softer competition and can reload much easier if necessary. If you play at stakes different than the ones listed above, use this rule: if you are a casual player, you should have 20 buy-ins. If you are a serious player, you should have 40 buy-ins. If you are a professional player, you should have at least 100 buy-ins. Once you decide to become a serious or professional Internet poker player, the best way to improve your play is to analyze your Internet poker statistics to find and correct flaws in your game. 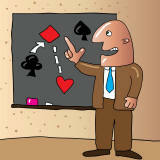 Some of the most popular poker strategy tools include PokerTracker and PokerOffice. The programs download your hand histories and automatically analyze them so you can find holes in your game, and decide how to fix them. Copyright © 2010 InternetPoker.org All Rights Reserved. Contact Us For More Information.